Four Horsemen reveals the fundamental flaws in the economic system which have brought our civilization to the brink of disaster. The film features 23 leading thinkers who break their silence to explain how the world really works. The documentary pulls no punches in describing the consequences of continued inaction, but the movie’s message is one of hope. If more people can equip themselves with a better understanding of how the world actually works, then the systems and structures that condemn billions to poverty or chronic insecurity can, at last, be overturned. 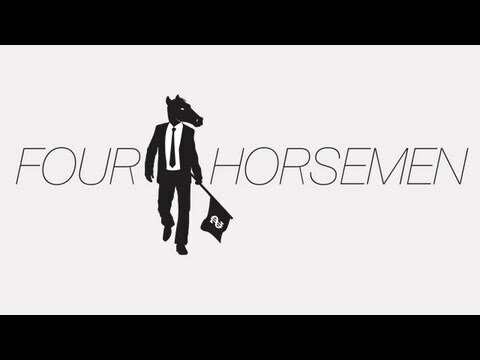 Four Horsemen is free from mainstream media propaganda, doesn’t bash bankers, criticize politicians or get involved in conspiracy theories. The documentary ignites the debate about how we usher a new economic paradigm into the world which, globally, would dramatically improve the quality of life for billions. A pretty fair and honest look at things. Few quibbles, but otherwise a 4 star affair.